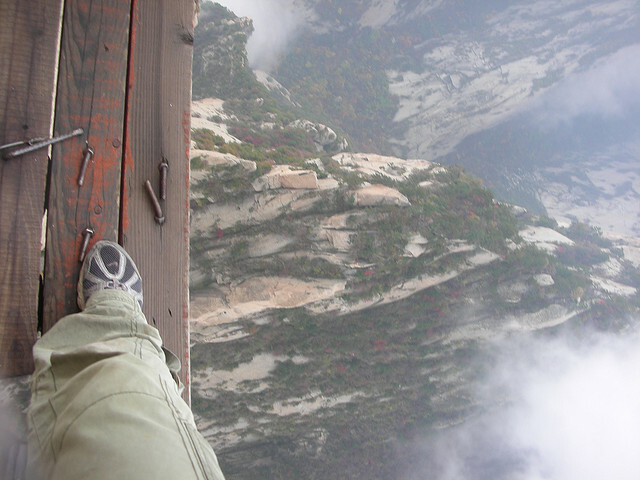 For the ones who like to travel to the far corners of the world and have adventure in their blood this is a must see place and a guaranteed rush of adrenaline. 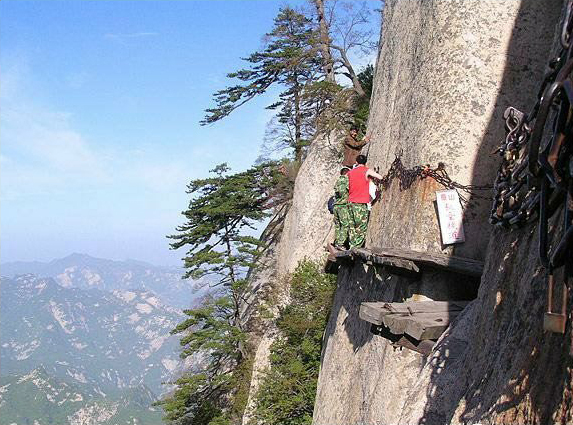 Thousands of people each year decide to go on one of the most dangerous roads in the world. 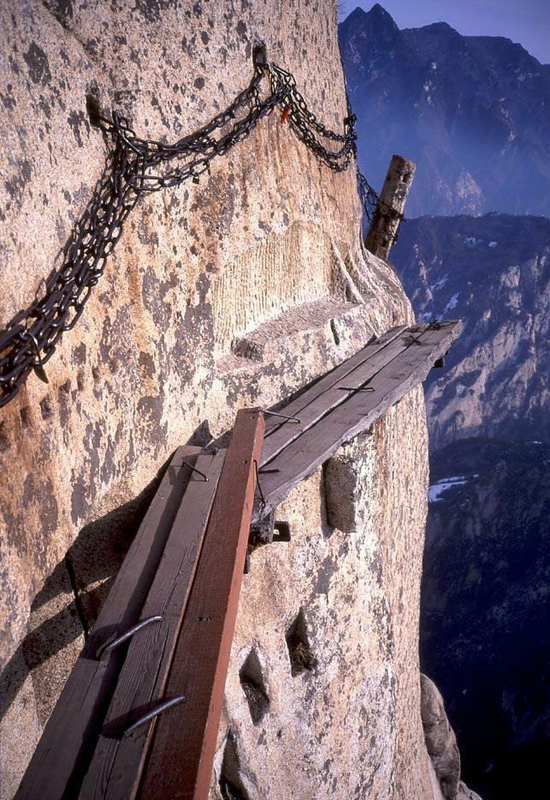 It is composed of rickety stairs and paths with planks nailed on the rocks. 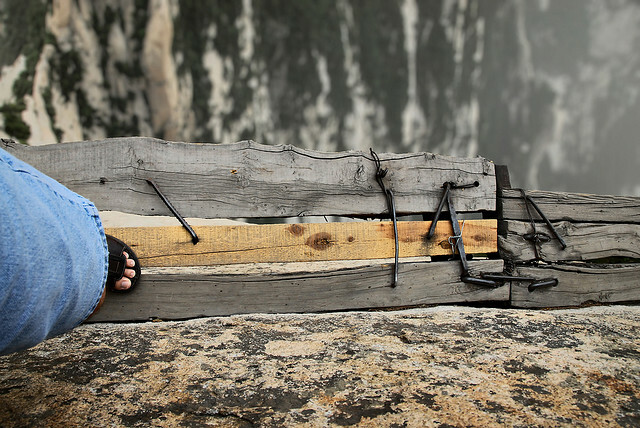 At every step, they put their lives at risk to test their limits and to reach the famous teahouse in the top of the mountain Huashan in China. 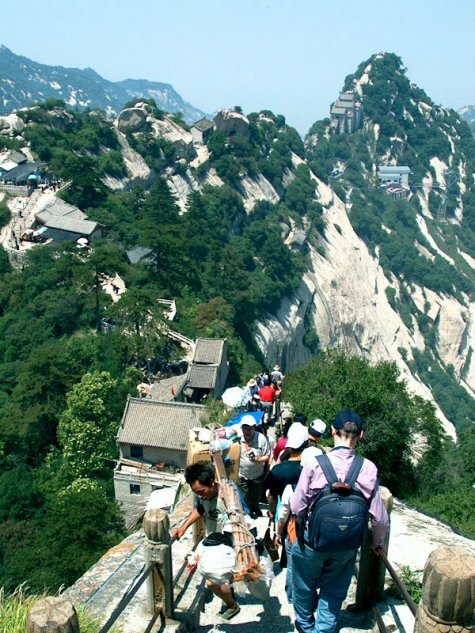 Mount Huashan is located in Huayin, part of the Shaanxi province. The closest city, Xi’an, is 120 kilometers away. 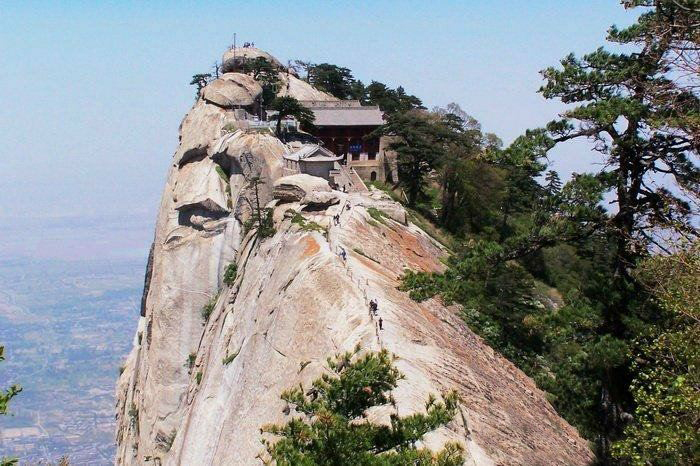 The teahouse of the top of the mountain is located on the south side of the mountain, at an altitude of 2,160 meters. 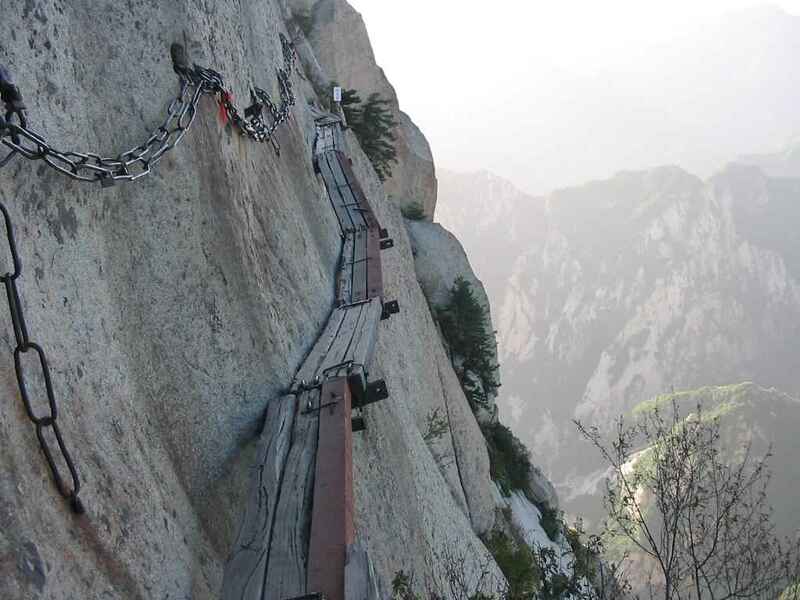 Viewed on a map the Huashan mountain chain looks like a flower. 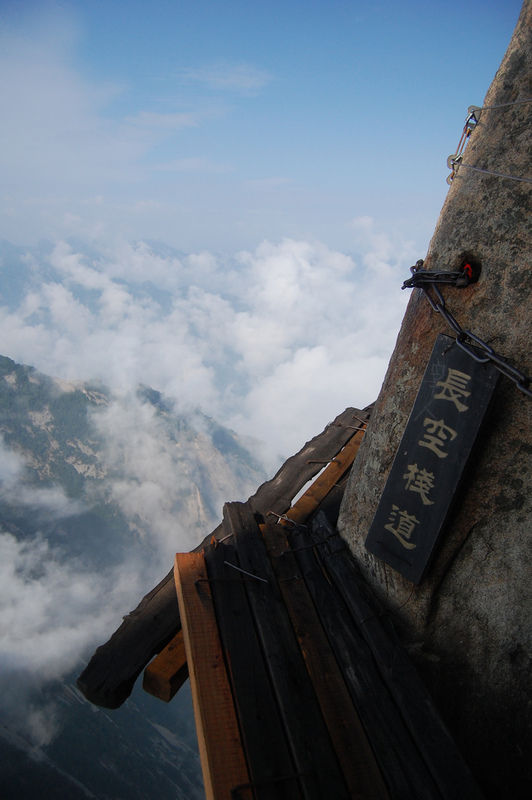 The teahouse at the top of the mountain is actually one of the many Taoist temples located on the five peaks that make up the Huashan Mountain. 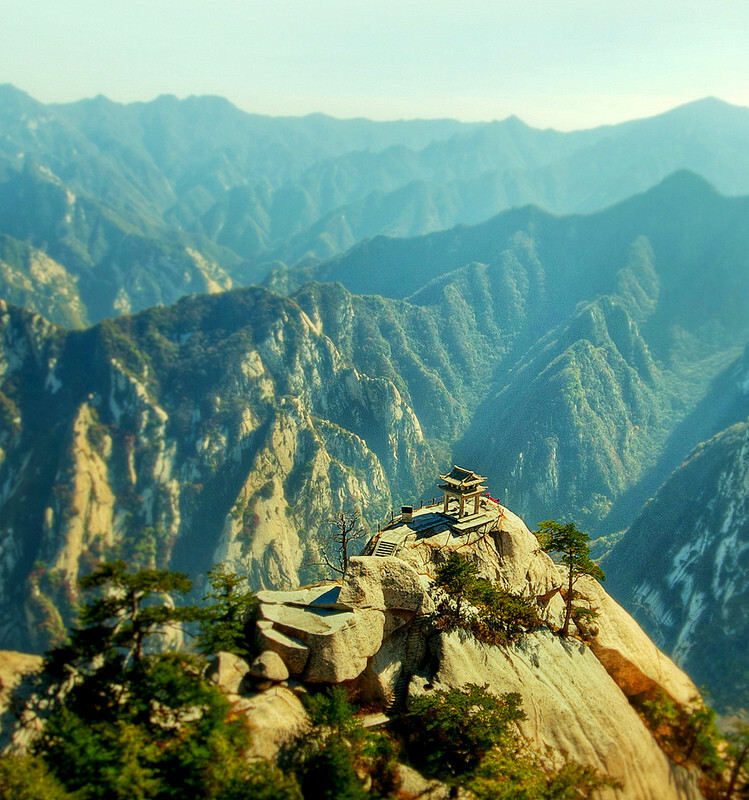 Given that the first inhabitants of this region practiced asceticism their daily meditation was accompanied by a cup of tea. Thus, after decades the temple became a tearoom that’s visited annually by thousands of tourists. 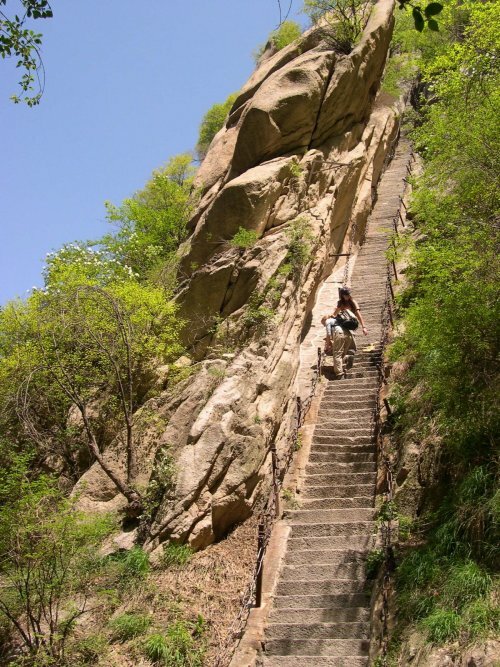 The road to the mountain top starts with a lot of huge stairs, nicknamed “The Heavenly Stairs”. 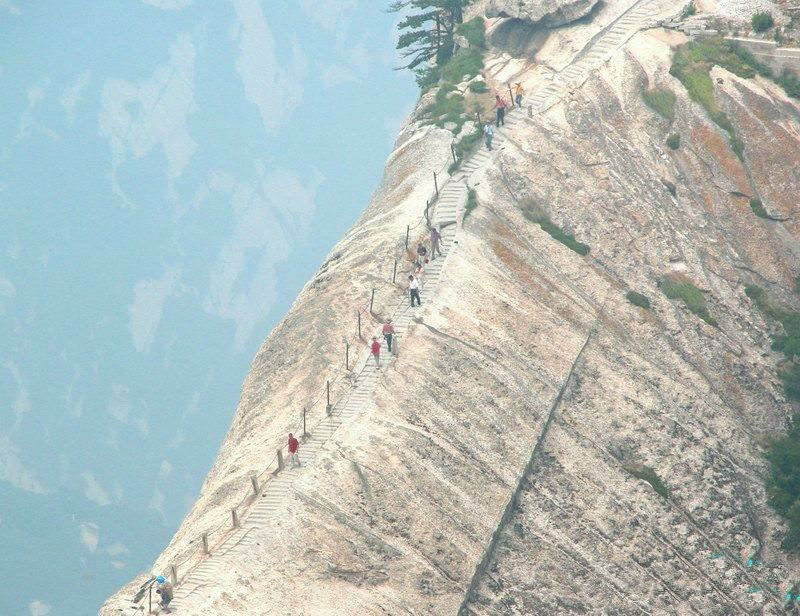 The first impression is that the stairs lead to the heaven, it’s like climbing towards the clouds and it’s impossible to see where the stairs end. On your way to the top you’ll see houses and even small villages. However, the road does not stop here. 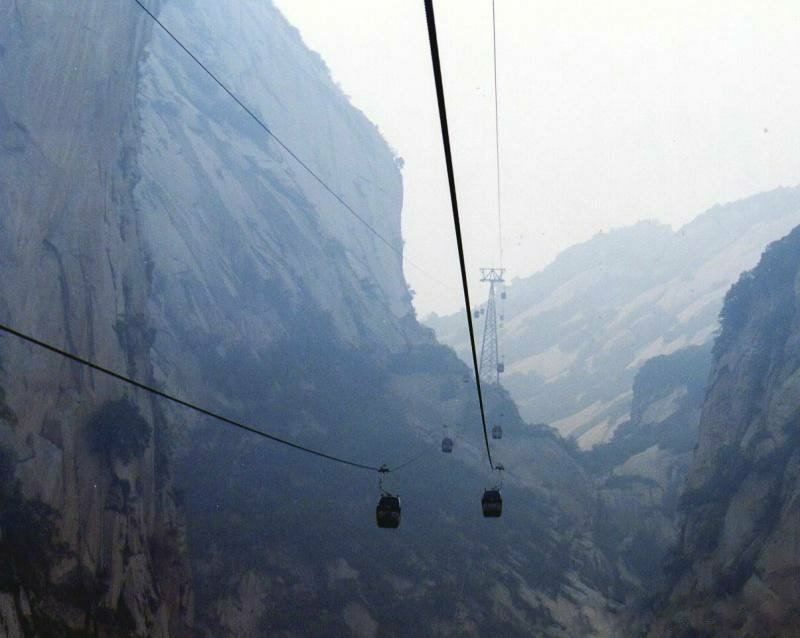 After passing the stairs a gondola will take you to the teahouse. 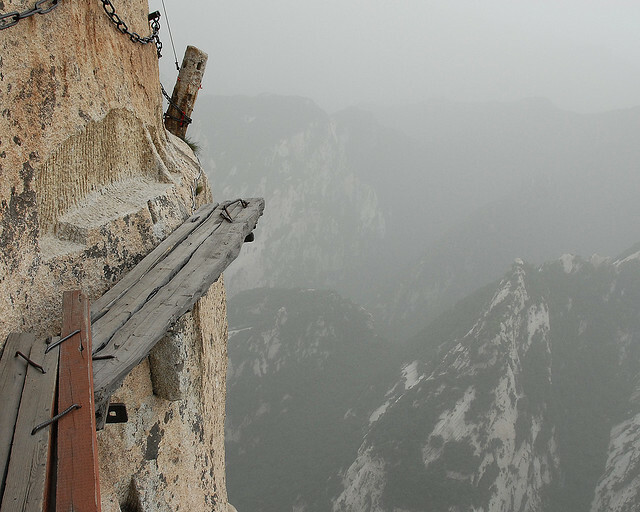 However, don’t be scared to climb the stairs because it’s the most accessible part of the journey you have embarked on. 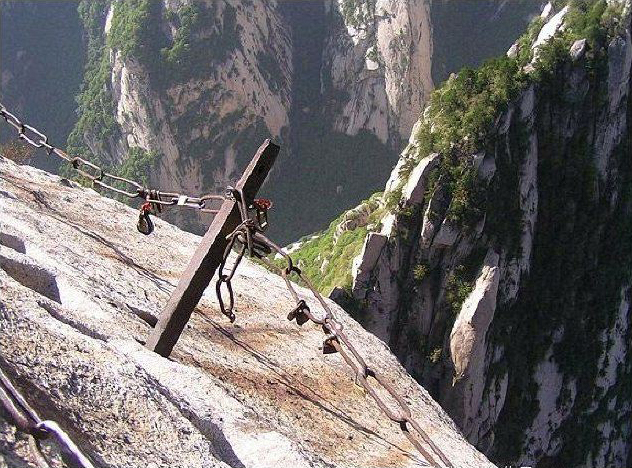 Once you are on the southern side of the mountain one of the most dangerous routes in the world awaits. 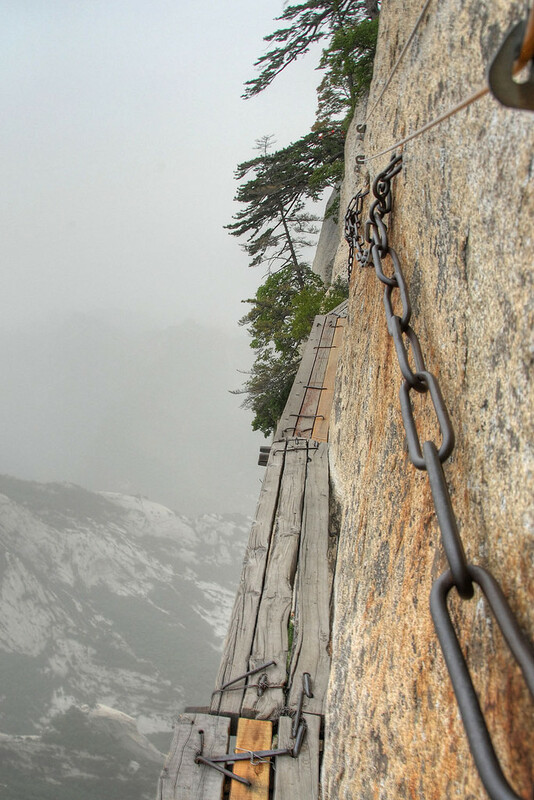 The path is made of thin planks that are fixed in the mountain and to keep your balance you must hang onto chains that are nailed in stone. There’s nothing else to keep you safe. 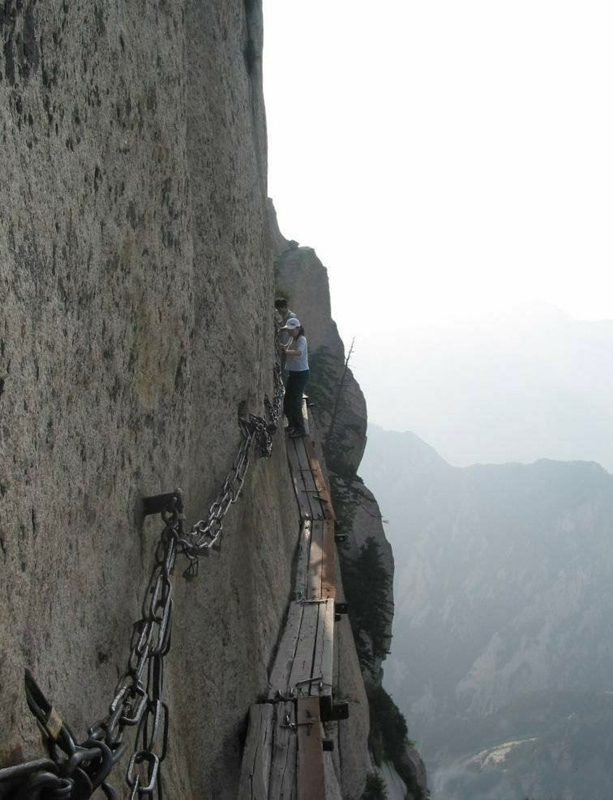 If that wasn’t enough you’ll have to climb a chain and use dug out holes with your feet to keep your balance. The images speak for themselves. 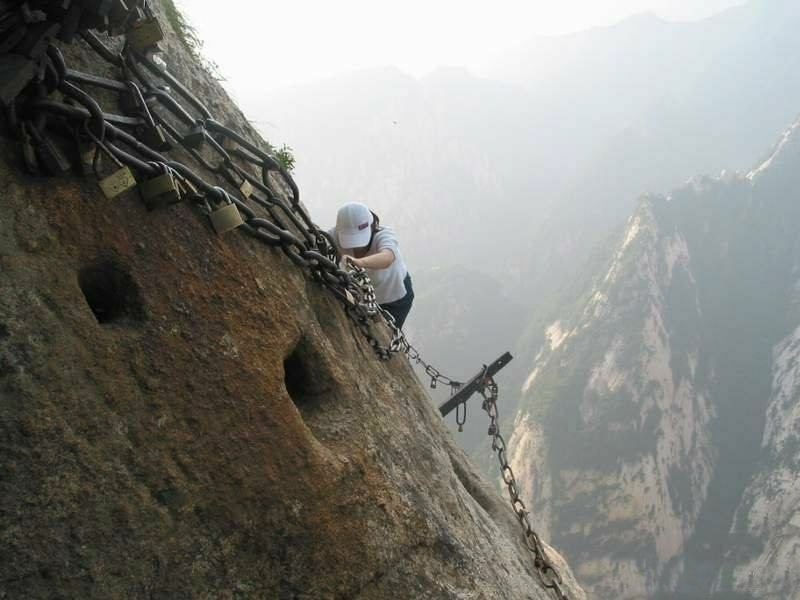 The tea at the end must be amazing to deserve such a long and dangerous climb. read a book, check your email, surf the web and more.